GcMAF is a new age discovery that reveals the body’s crucial defence mechanism against infectious diseases, immune disorders and cancer. A human protein, GcMAF works by mediating the immune system and act against malignant cells and pathogens. Health issues occur when viruses and cancer cells produce an enzyme called nagalasethat suppresses the production of the body’s own GcMAF, rendering the body defenceless against infections and an unhealthy proliferation of cells. GcMAF Forte is essentially a complementary therapy that supplements your body with GcMAF and boost the body’s defence mechanism. This protein binds with Vitamin D to activate, regulate and expand macrophages to become cytotoxic to tumours and other antigens. WHY IS OUR GCMAF BETTER? 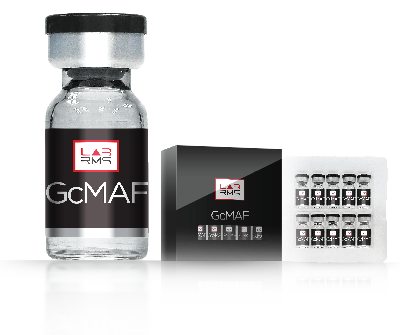 GcMAF Forte by LAB RMS is formulated with high molecular weight hyaluronic acid (HMW-HA) to boost anti-cancer activities. HMW-HA has been linked to studies on longevity and cancer resistance in mammals. HMW-HA is found to stimulate the endogenous production of granulocyte colony macrophage activating factor (GcMAF) in healthy subjects and patients with cancer burden while low molecular weight HA does not have this immune powering effect. Combination with HMW-HA also promotes slow release of GcMAF.